simultaneously receiving all three of the main satellites that DIRECTV® broadcasts their High Definition and Standard Definition programming on. The Sea Tel 120 TVHD is also capable of receiving worldwide Ku-Band High Definition and Standard Definition programming without having to make adjustments to the hardware. • Receives (2) Ka-Band and (1) Ku-Band DIRECTV® satellites simultaneously. Enjoy DIRECTV® HD programming at the dock, on anchor, or underway. 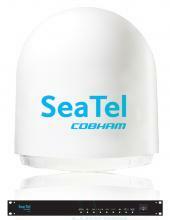 • Programmable LNB that receives worldwide Ku-Band services. No more changing LNB’s when travelling to different regions of the world. • Integrated DVB-S2 tuner for reception and identification of DVB-S2 and DVB-S satellite broadcasts. • Frequency tuned radome minimizes signal loss. • Easy installation and use. Uses same bolt pattern as the Sea Tel Series 04 systems. • Extensive capabilities for online and offline troubleshooting. • Intuitive and secured user interface with extensive data logging capabilities. • Worldwide service along with 2 years parts and 2 years labor warranty (Flex warranties available). • Built to last in extreme conditions. Included is an integrated and secure user interface with extensive logging capabilities and as will all Sea Tel products, it is built to last in extreme conditions.